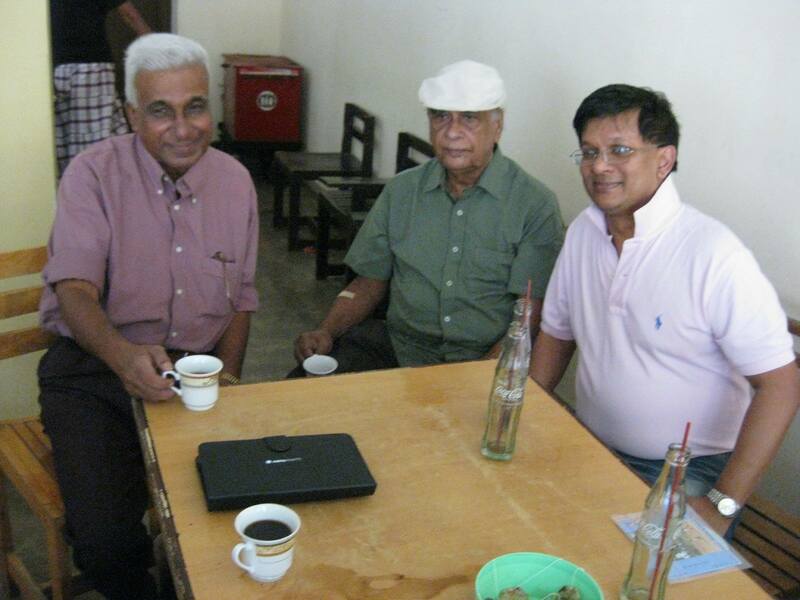 Sri Lankan author Vijith Kumar Senaratne has mentioned Vernon Corea in his new book ‘Rasa Mathaka Asiriya,’ published in Colombo, Sri Lanka. Author Senaratne, with two previous books to his credit including one on pioneer singer Sunil Santha, has researched extensively his subjects and their careers, thereby bringing out a plethora of fascinating detail. In the meandering tone of a natural story teller who loves telling his stories, Senaratne mentions that Sunil Santha gave away his thriving music class to young Amaradeva at a time when he himself was quite short of money. Or that Leela, Sunil’s wife, saved a couple of Tamil neighbours from a mob during the July 1983 riots, and that she died holding the hand of her old friend Dr. Thilokasundari kariyasasam. Sitarist Athukorala went on his father’s shoulders to see Rabindranath Tagore lay the foundation stone for the Sri Pali school in Horana. Photographer and film producer Chitra Balasuriya’s Chitra Studio in Gampaha was a haven for actors and musicians, paving the way for films such as Parasathu Mal and Thunman Handiya. The career of flutist Weerasena Pieris, whose mellifluous tones can be heard in songs such as W. D. Amaradeva’s Pipunu Kusuma and Victor Ratnayake’s Thotupola Aiye, was cut short when he was attacked with a knife as a political reprisal. 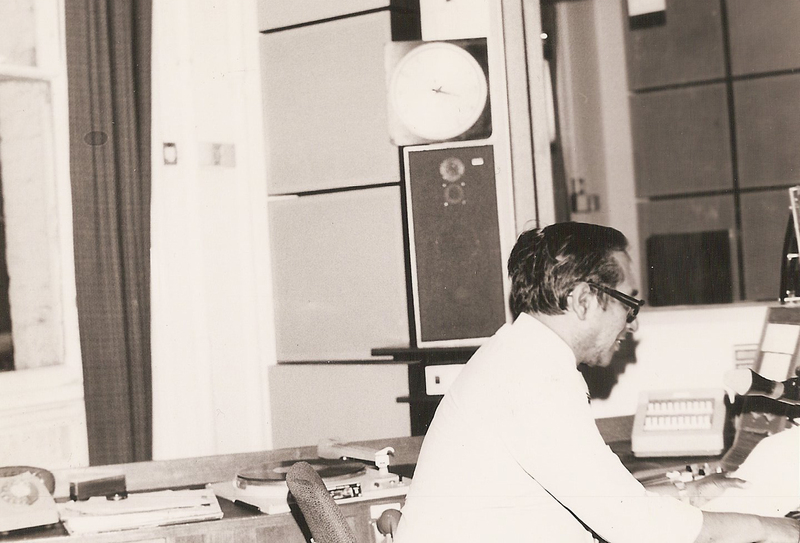 Announcer Gunathunga K. Liyanage pioneered the broadcasting of Hindi songs on SLBC’s Sinhala commercial service, introduced direct phoning during live programmes into Sinhala medium broadcasting, allowing scholar Edwin Ariyadasa to comment directly while news of man’s first steps on the moon were being broadcast. When it comes to the teaching profession, Maya Abeywickrema rendered invaluable services as a music teacher, widening the scope of Western music education in our schools and initiated the National Youth Orchestra, producing many fine Western classical musicians. Prof. J. B. Dissanayake made the study of Sinhala an attractive proposition and wrote books in English for those studying it as a second language. Hemapala Perera, adept protagonist of the mandolin and tabla though better known for flute playng, went blind at a tender age due to a botched innoculation. Nimal Mendis, composer of ‘Master Sir’ and ‘Ganga Addara’, wrote and performed the music with his UK band for songs by British jazz singer Mary Marshall. Mendis and his wife Ranjani made several documentaries too, including Dawn of Terror and Stop Killing, Start Singing. Singer Irene Malini Ranasinghe, now largely forgotten, comes live in these pages. 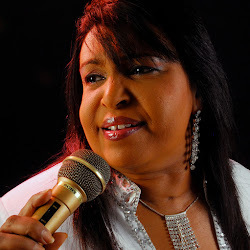 She made her mark as a playback singer in the films “Mee Messo” and “Arunata Pera.” Singer Wasantha Sandanayake was actively involved in film making, working in films such as ‘Wahal Dupatha’ and entertaining people with Tamil songs whenever the film locations were in the hills. Narada Disasekara, though he became one of our best known singers in the 60s, studied science and joined the SLBC as a recording technician, achieving such fame in that profession that he recorded Ravi Shankar and was sought out by Sunil Santha to record his lament when PM S. W. R. D. Bandarnaike was killed. Narada got his break as a singer in the film ‘Sikuru Tharuwa’ thanks to film star Punya Heendeniya, who convinced music director R. Muttiswamy to give him a chance to sing. Some of M. S. Fernando’s slower songs such as ‘Bola Bola Meti’ came out of a creative necessity, due to a SLBC ban on fast rhythms during the Ridgeway Thilakaratne era. Radio announcer Elmo Fernando was so enamoured as a schoolboy by Prosper Fernando’s Hindi songs programme that he habitually ran 15 minutes from home to school after hearing it to the end. SLBC’s Vernon Corea noticed this young enthusiast and handed him over to Karunaratne Abeysekara who took him under his wing. 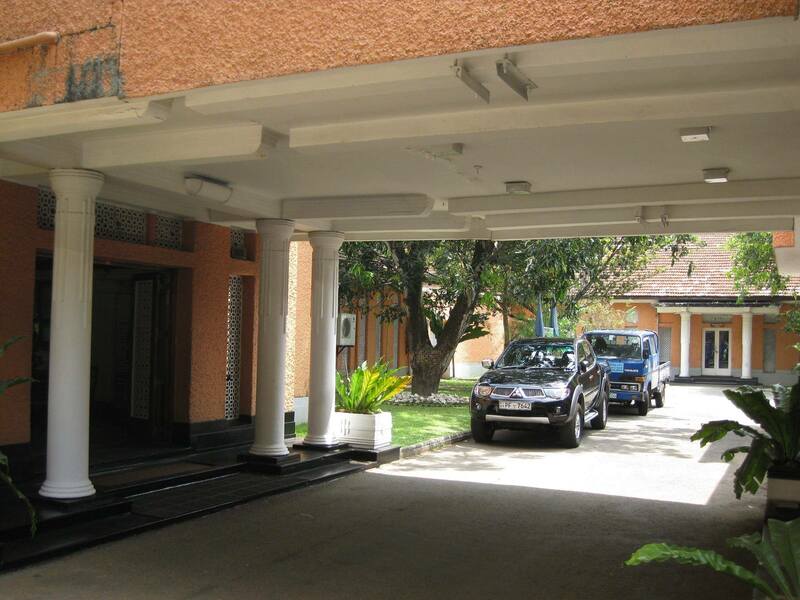 In the same era, prolific musician and multi-instrumentalist Douglas Ferndinands lived in a house along Park Road, Havelock Town, which was more recently occupied by politician Douglas Devananda. The book is filled with many such anecdotes and reminiscences. Published by Agahas Prakashakayo, 717/2, Madinnagoda, Rajagiriya, the book is available at leading bookshops including Sarasavi, Gunasena, Sooriya, Vijitha Yapa and Surasa Maradana. 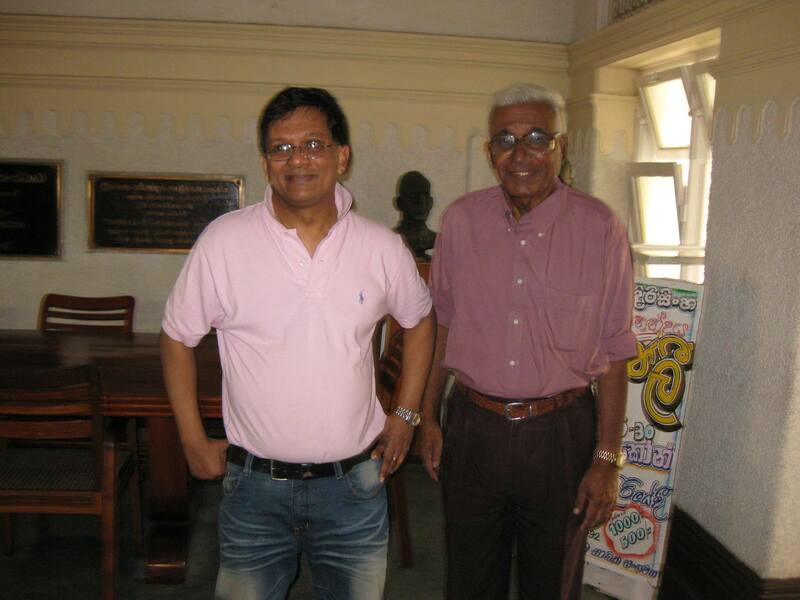 The veteran Radio Ceylon/SLBC broadcaster Laddie Hettitarchchi passed away in Colombo, Sri Lanka. His funeral was held today. May his soul rest in peace. 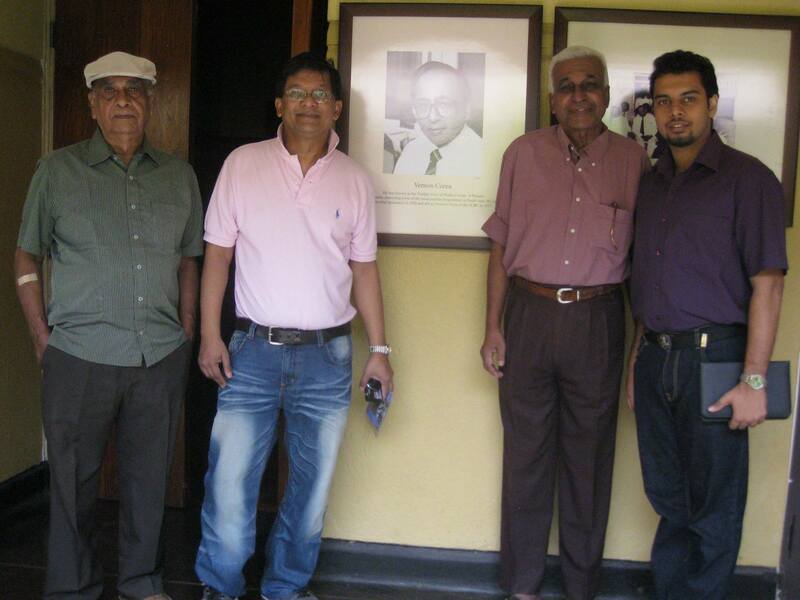 Recently Vernon Corea’s son, Ivan visited the Sri Lanka Broadcasting Corporation and met with the new Chairman, Attorney At Law Nanda Muruttettuwegama, SLBC staff at the station including veteran broadcaster K.S.Sivakumaran, Nihal Bhareti and the legendary composer and singer/songwriter Nimal Mendis and his son Paul Marie Mendis. 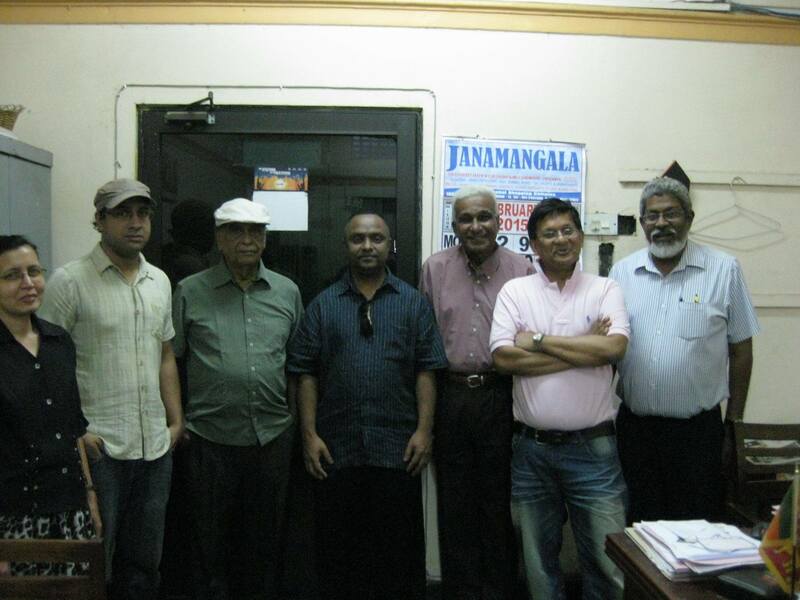 It was a wonderful meeting at the Sri Lanka Broadcasting Corporation – joining them were the top SLBC producer Indira Priyadarshini Nawagamuwa and members of the Radio Ceylon Facebook Group Chrismarlon Perera and Shantilal Vairwaranathan. 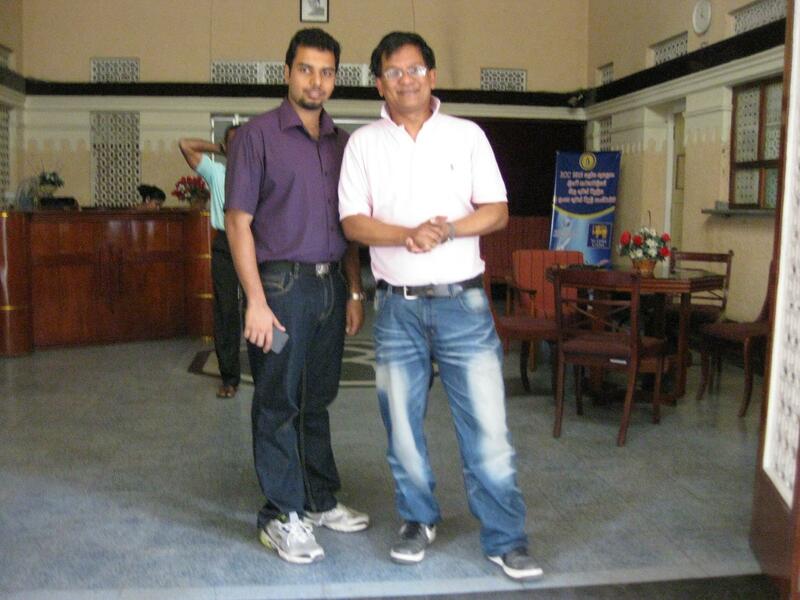 Ivan was interviewed by SLBC legend Nihal Bhareti over the airwaves of the station. 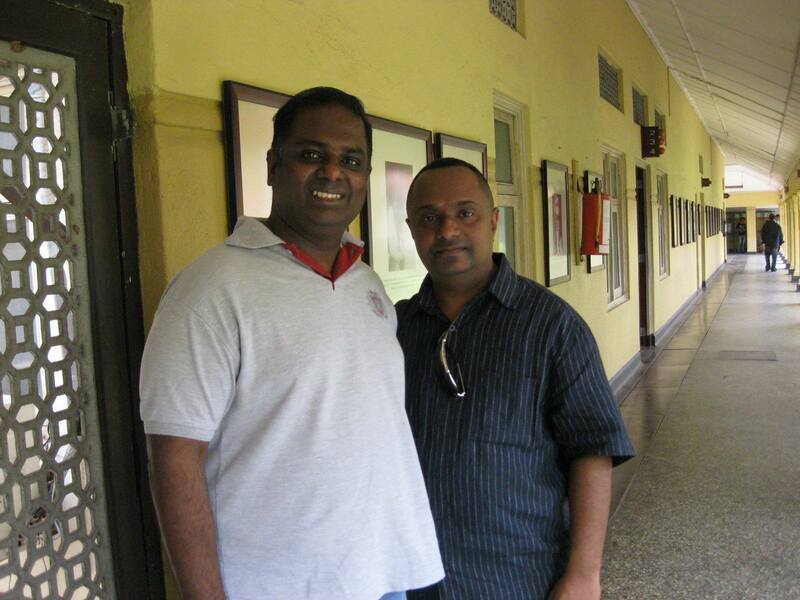 Chris Marlon Perera of the Radio Ceylon Facebook Group with Ivan Corea in the foyer of the SLBC. 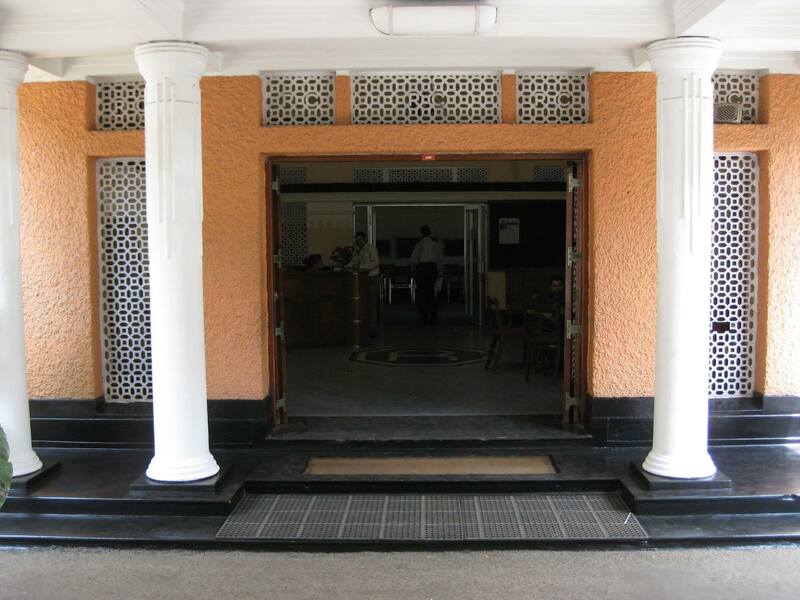 The entrance to the Sri Lanka Broadcasting Corporation. 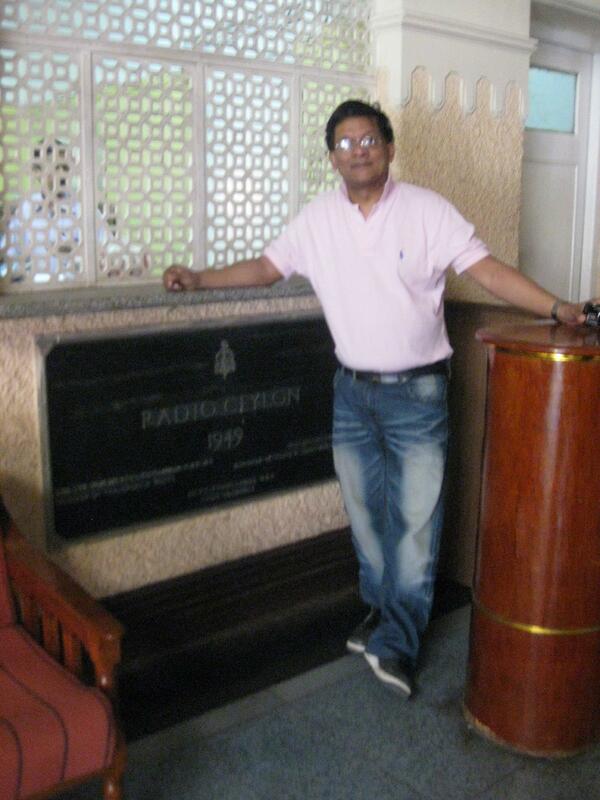 Ivan Corea near the original foundation stone of Radio Ceylon – Sri Lanka Broadcasting Corporation in Colombo. 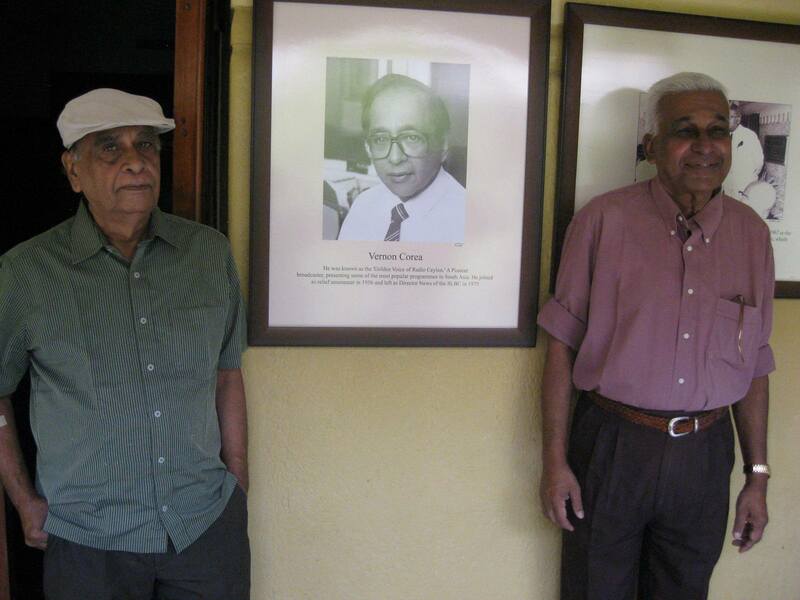 Top Sri Lankan singer-songwriter Nimal Mendis and the veteran broadcaster K.S.Sivakumaran with the photograph of legendary Radio Ceylon/Sri Lanka Broadcasting Corporation broadcaster Vernon Corea. 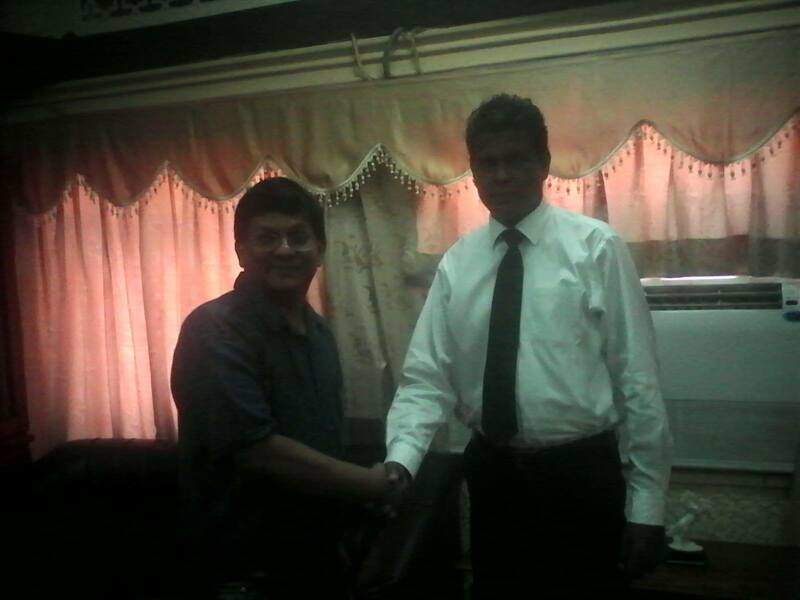 Attorney At Law Nanda Muruttettuwegama the new Chairman of the Sri Lanka Broadcasting Corporation with Ivan Corea – on the right of the picture. 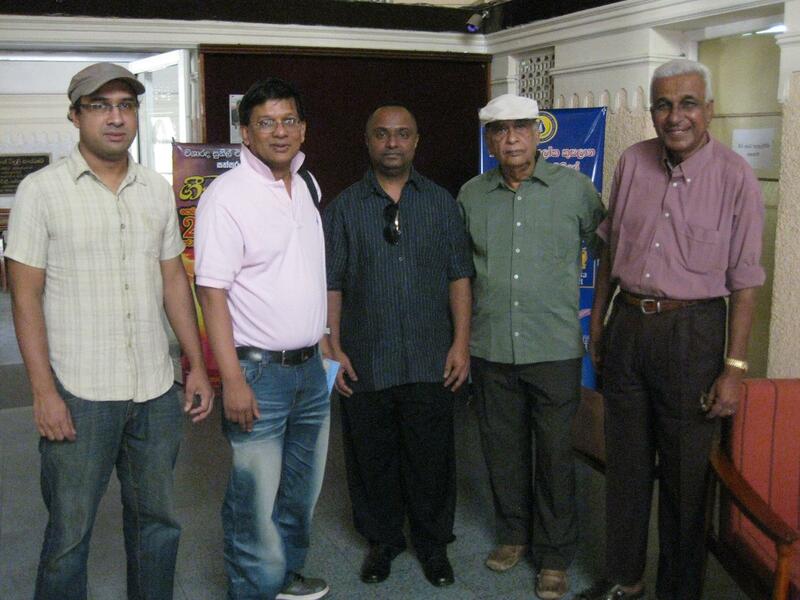 Sri Lanka Broadcasting Corporation broadcasters with Ivan Corea and Nimal Mendis. 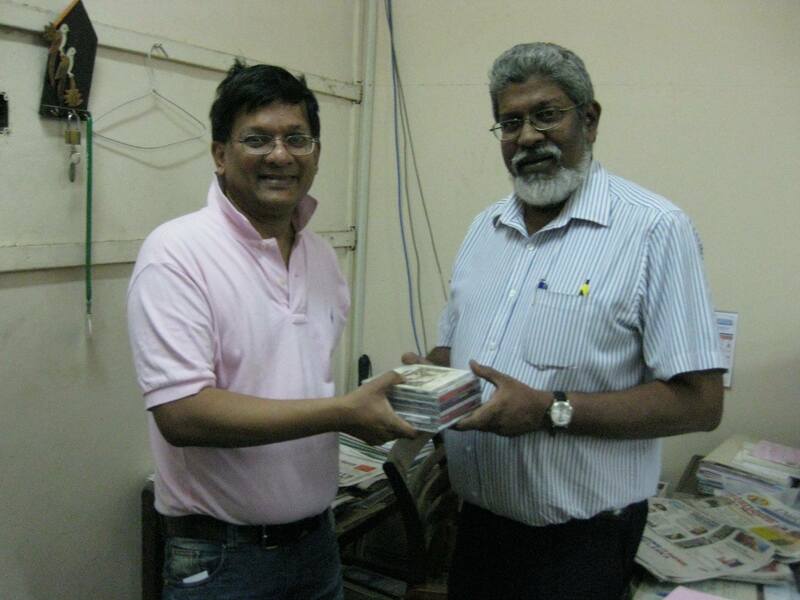 Ivan Corea with the legendary Radio Ceylon Broadcaster K.S.Sivakumaran at the Sri Lanka Broadcasting Corporation. Sri Lanka Broadcasting Corporation legend Nihal Bhareti interviews Ivan Corea in a studio. 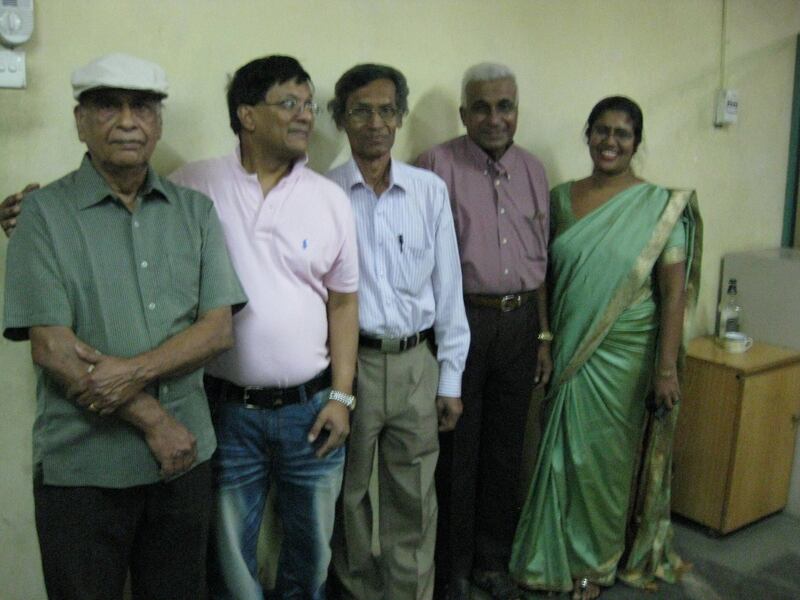 Ivan Corea with senior journalists in the News Division of the SLBC. 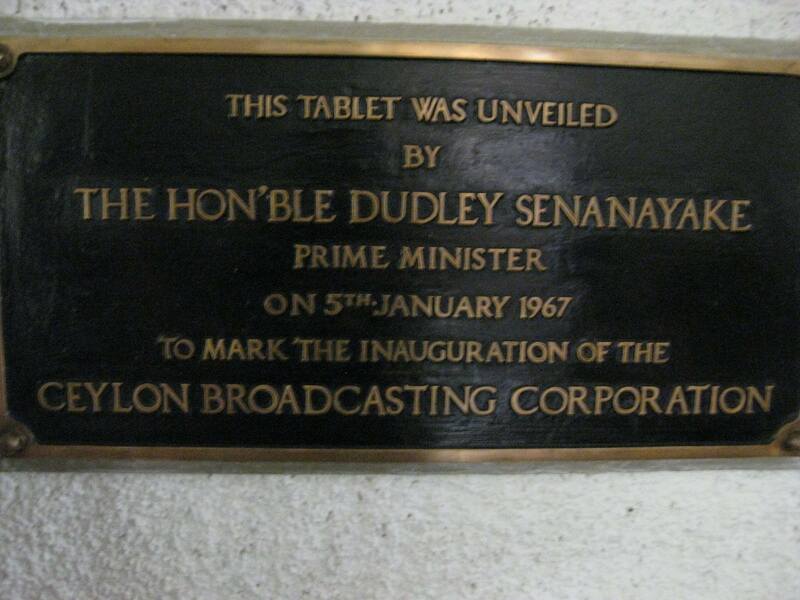 The late Vernon Corea was Director News of the Sri Lanka Broadcasting Corporation in 1975. 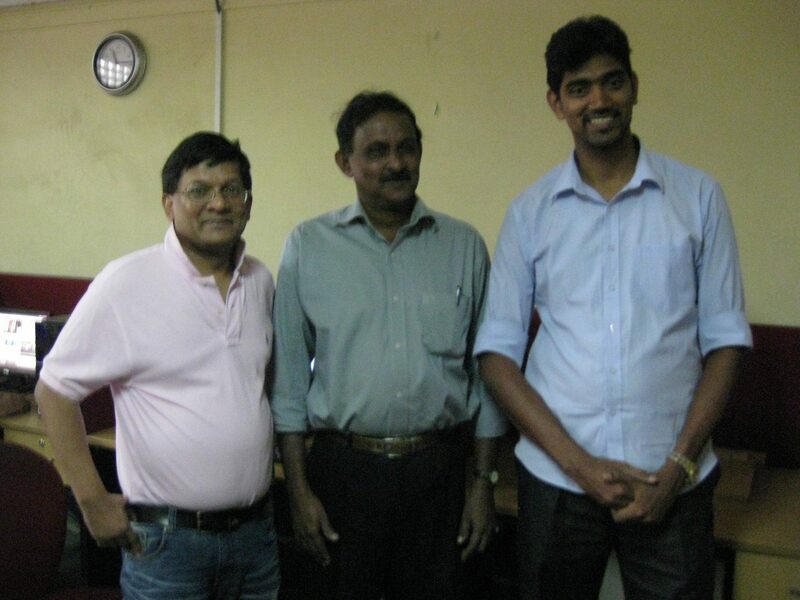 At the Sri Lanka Broadcasting Corporation – Radio Sri Lanka. 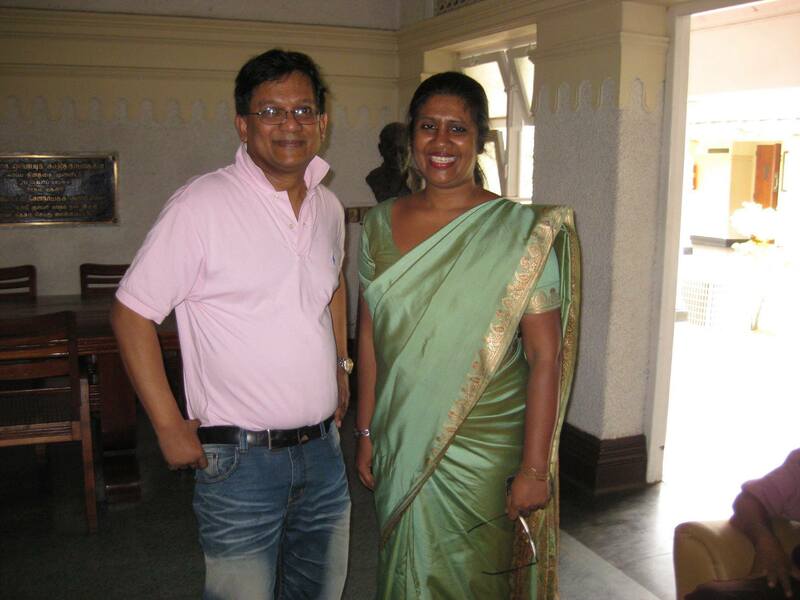 Ivan Corea with top Sri Lanka Broadcasting Corporation (Radio Sri Lanka) Producer Indira Priyadarshini Nawagamuwa. 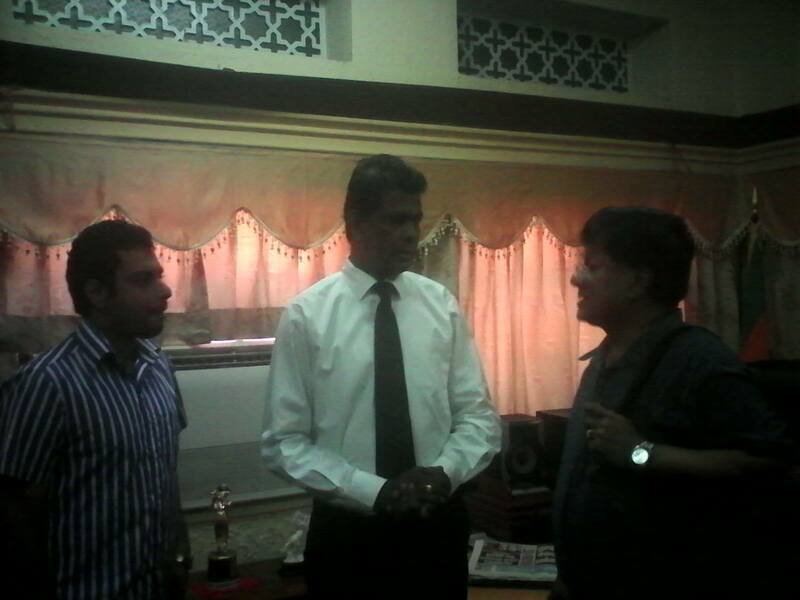 At the English Services of the Sri Lanka Broadcasting Corporation with SLBC Director Yusuf Noordeen. 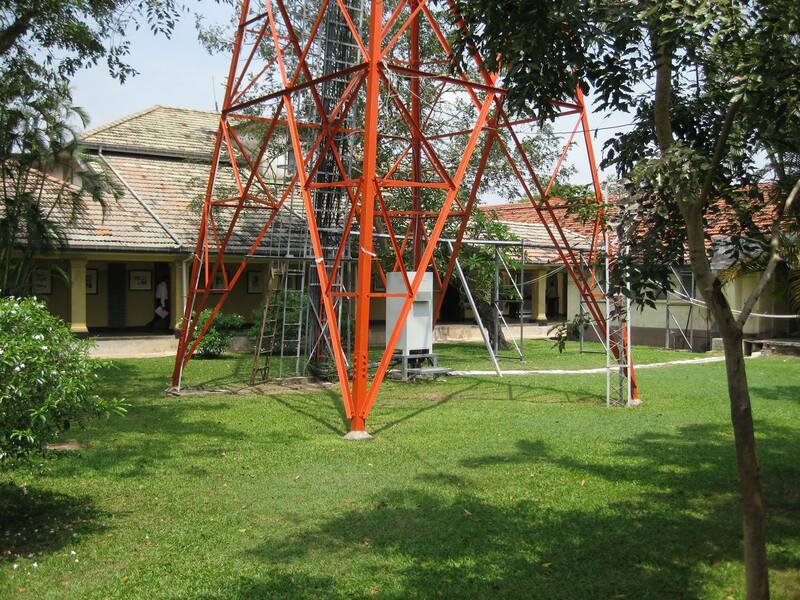 The airwaves of Radio Ceylon a remant of the old building from 1948. Usha K.R. has mentioned Vernon Corea of Radio Ceylon in her novel ‘Monkey Man,’ published by Penguin. Indian author Usha K.R. has won several literary awards. Penguin published ‘Monkey Man’ in 2010. 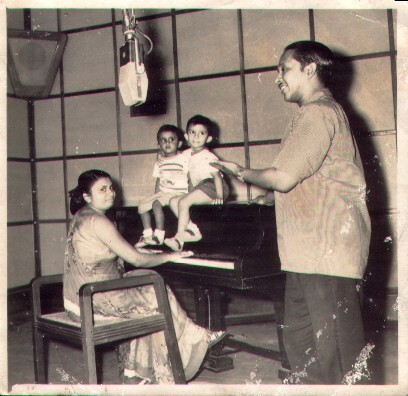 Vernon Corea of Radio Ceylon with his family in a studio in the 1960s. Celebrated Indian author Usha KR has mentioned the legendary broadcaster Vernon Corea in her novel ‘Monkey Man,’ published by Penguin. 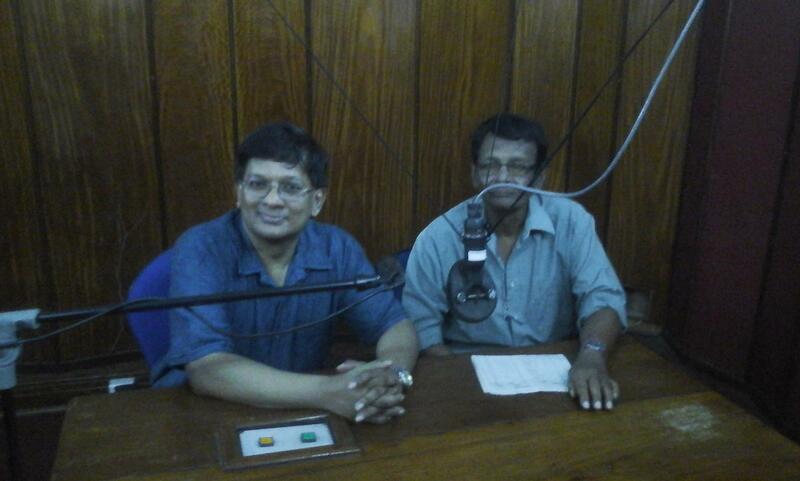 Her principle character Shrinivas Moorty listens to the voice of Vernon Corea on Radio Ceylon. She writes: ‘Shrinivas Moorty could say it was the voice of Vernon Corea that had seen him through puberty. At a time when Indian radio stations did not play ‘English’music, Radio Ceylon was a life line….’ Usha KR goes on to mention that listeners knew Vernon Corea so well. Monkey-man begins on 3 January 2000. It is the start of the new millennium. On Ammanagudi Street in Bangalore, a strange creature is spotted. As the beast seizes the imagination of the city, the first people to sight it—Shrinivas Moorty, a teacher in a local college, Pushpa Rani, who works in a call centre, Neela Mary Gopalrao, secretary to an influential man, and Sukhiya Ram, her office boy—are invited to talk about it on Bali Brums’s hugely popular radio show. What was it that they saw? A bat? A malevolent avatar? 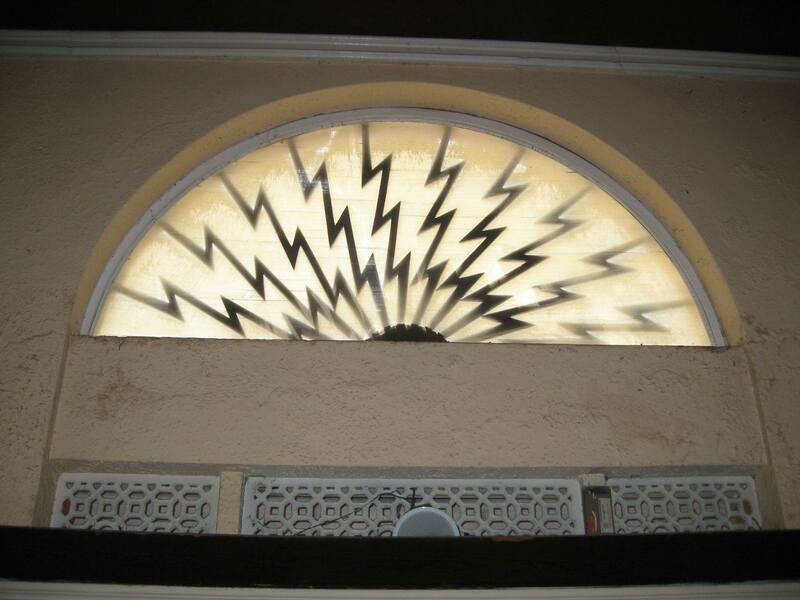 A sign of the displeasure of the gods? The grotesque mascot of a city that is growing too fast and crumbling too soon? Or merely a monkey that has lost its way? Usha K.R. has been writing fiction for over three decades, beginning with short fiction. 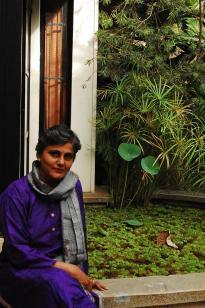 Her short story ‘Sepia Tones’ won the Katha Award for short fiction in 1995. Her novels include Sojourn,1998;The Chosen, 2003; A Girl and a River, 2007; and Monkey Man, 2010. . “A Girl and a River” won the Crossword Award in 2007 and was listed for the Commonwealth Writers’ Prize. 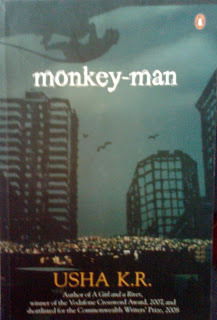 “Monkey Man” was short listed for the DSC Prize for South Asian literature 2012 and was listed for the Man Asia. Usha lives and works in Bangalore. 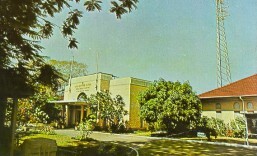 Vernon Corea visited Bangalore with his family in January 1975. Wherever he went people remembered him and Radio Ceylon. Veteran Radio Ceylon/SLBC Broadcaster K.S.Sivakumaran’s news feature published in the Daily News Sri Lanka. We quoted the full article in an earlier post. 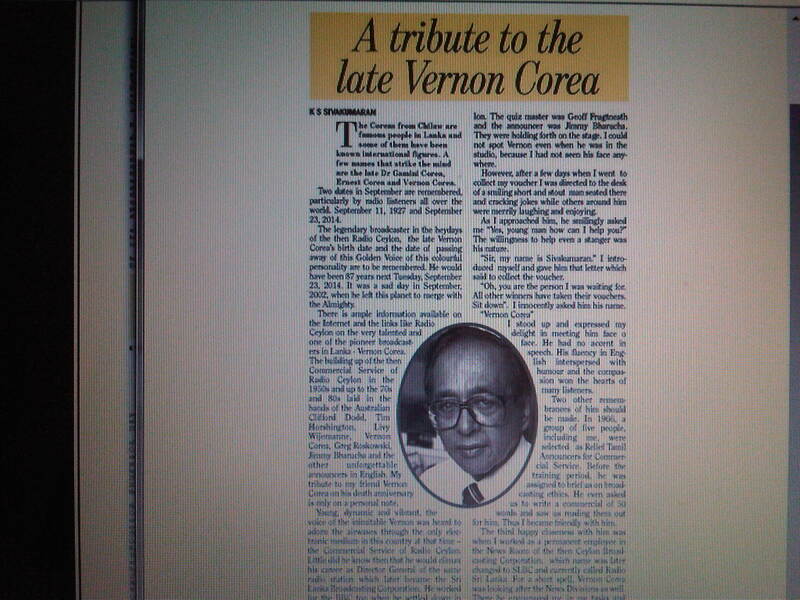 The article in the Daily News was published on 17th September 2014 to mark the 12th Death Anniversary of Vernon Corea on 23rd September 2014. 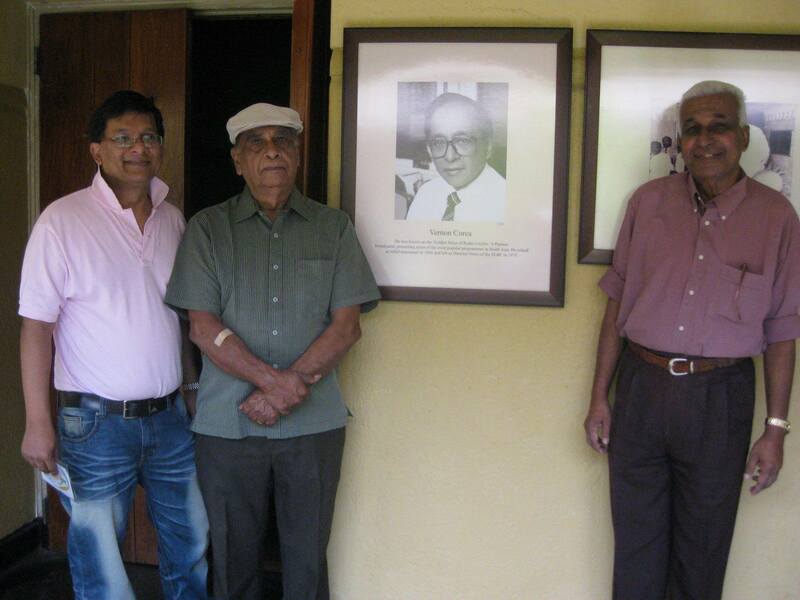 Veteran Radio Ceylon/SLBC Broadcaster K.S.Sivakumaran wrote a moving news feature on his friend Vernon Corea who left the Sri Lanka Broadcasting Corporation in 1975 as Director News. 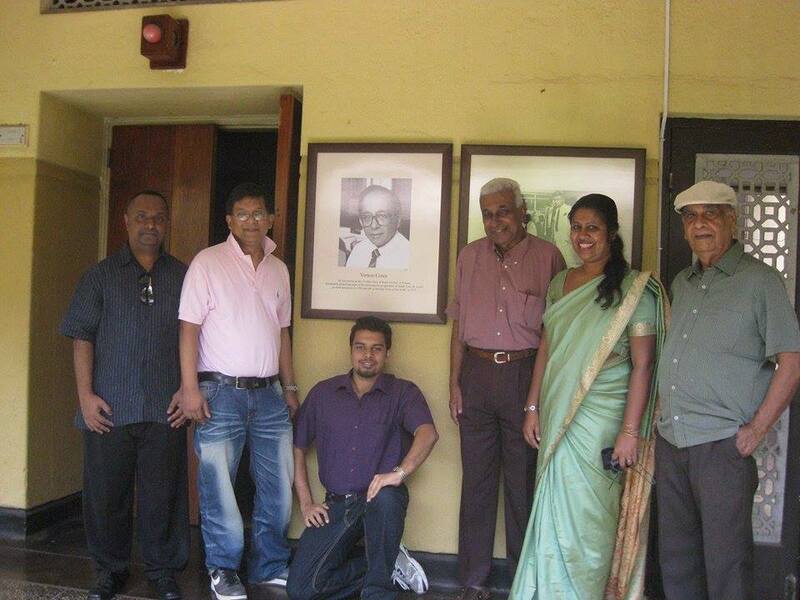 Sivakumaran recalls his first meeting with the legendary Sri Lankan broadcaster at Radio Ceylon in the 1960s.